I watched the movie one night during my final-days-of-pregnancy-insomnia because I could instantly view it on Netflix and I was curious about it. I'm happy to say that this is one of those times when the movie was so very enjoyable to me, that I then I had to read the book. Enter: Amazon. On one particular day Winnie decides that she is going to run away from home, which pretty much consists of her exiting the fence which surrounds her family's property. She goes off to explore the woods which the family owns and which are situated right next to her home. Once in the woods, Winnie comes upon a spring which holds water that, if drunk, will cause the person or animal to live forever, unchanged. She meets the Tuck family who had previously drunk from the spring, unaware of the spring's hidden powers. The Tucks desire to protect the spring from unsuspecting drinkers and so kidnap Winnie simply to have the time to convince her of the importance of keeping the spring a secret. The book is a big question: Is it a good thing to live forever and never die? Or is it preferable to live life as fully and completely as possible, experiencing the variety of life's seasons which, of course, concludes with death. Should we be afraid to die? Should we want to freeze time in any particular moment and exist there forever? It's a curious question and definitely piques the interest of humanity at large. Death is a feared fiend to most people and it can, depending on what you believe, signal an end. It can be viewed as terrifying - as the unknown often times is. For the Christian, of course, we believe that death is not the end and that Christ has conquered this foe. (1 Corinthians 15:55) We have no need to fear it, although we still clutch on to our humanity. That's as it should be. Christ gave us life and made us relational. It's hard to think of letting go and saying goodbye to the people we love in particular. Death's timing is not always enjoyed. Yet it is a sure enough thing -it will come to each of us. I think that this book , as dark and morbid as the subject matter may sound, is a fascinating and interesting story, asking questions worth discussing with young readers. I think this book is appropriately marked as a middle grade read and would heartily recommend it. As for the movie , I thought it was excellent and very well done. It stays true to the book for the most part except in one particular: the age of Winnie Foster. 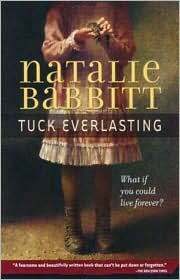 In Tuck Everlasting the movie she is much older, allowing her to enter into a believable romantic relationship with the younger Tuck boy. There is a kiss, but otherwise, it's really tame. The questions about life and death that the book asks are asked in the movie as well. Actually, I thought that the movie did a better job at more clearly pointing out the benefits and beauty of being able to live each season of life instead of being locked into one particular age or condition in time. The conversation that Winnie has with father Tuck on the river about drinking from the spring makes it very clear that the life that Winnie has is to be embraced and enjoyed, rather than traded in even for what she might currently believe is "true love." The book definitely suggests this truth to be the case. The movie makes it clear. So I appreciated both the book and the movie but for slightly different reasons. Either one I would recommend and I'm glad to own the book. At some point in time I wouldn't mind adding the movie to our home library to be enjoyed with my kids further on down the road. In the meantime, I'm still thinking about it and mulling it over. That, I think, is a sign of a pretty good story and this one is likely to end up as one of my favorite reads of 2011. Not sure how I missed this one up 'till now, but glad I've experienced it at last! I wasn't sure what this was about, but you've made me want to watch/read it! I read this as a required reading in 6th grade, and it stuck with me since then. That and "Bridge to Terebithia"
I've seen this one as an assigned read as early as 3rd grade, and I thought it was pretty weighty matter for students so young. I'll confess I thought the book and movie were both sort of weird, but I did enjoy them. 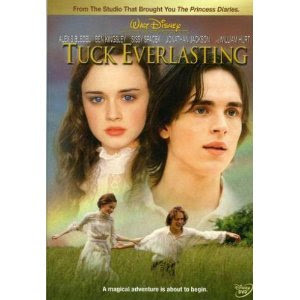 I remember tuck everlasting from my middle school lit class love it and the movie wasn't that bad. I wondered about the movie but avoided it because I remember it being very popular a few years ago. I generally don't enjoy movies that are popular and raved about. Maybe I'll watch this some rainy afternoon during nap time. Thanks for your reviews, Carrie. I read the book long ago, but this makes me want to see the movie. This book gave me the creeps...we read it for our Mother/Daughter book club...was glad that my daughter was a slacker that month and didn't read it. This is one of my all-time favorite books! I haven't seen the movie because I'm usually disappointed by the movie versions. Glad to hear the movie followed the book's story line. Thanks for your review. I was just holding the audio book in my hand yesterday and wondering if it was okay for my daughter to listen to. I put it back, but after reading your review I put it on hold. I remember leafing through it sometime in the past and then putting it back on the library shelf. Apparently, it wasn't sufficient to pique my interest. Your review, on the other hand, is sufficient! I think I'll have to give this one another go.